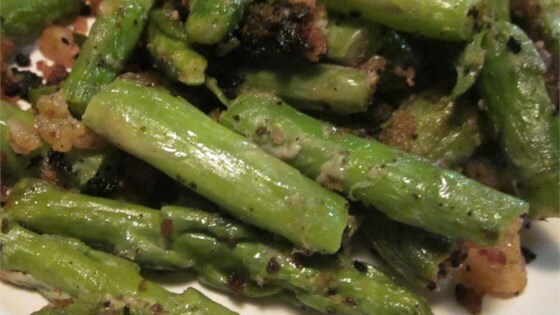 "This recipe is perfect to disguise asparagus for picky eaters." Bring about 2 inches of water to boil in a saucepan. Add the asparagus, and cook for about 3 minutes. Drain, and pat dry. Heat enough oil to cover the bottom of a large heavy skillet over medium to medium-high heat. Whisk the egg in a small bowl, and place the cracker crumbs in a separate bowl. Dip the asparagus pieces into the egg, and then coat with cracker crumbs. Fry in the hot oil until golden. Turn frequently for even cooking. If they are browning too quickly, reduce the heat a little. Drain on a paper towel-lined plate before serving. This was a great recipe! The kids loved it. I added some parmesan cheese to the crackers and that came out good too. My daughter HATES asparagus but she loved this! This was a huge hit with my family. I ended having to make another batch that night it was so good! i used bread crumbs instead of crackers...really added a nice taste to it. MY mom Hates asparagus but when it's cooked this way she loved it. The next day we all ate it re-heated, still fantastic.